It might look pretty, but if it doesn’t work then what good is it? 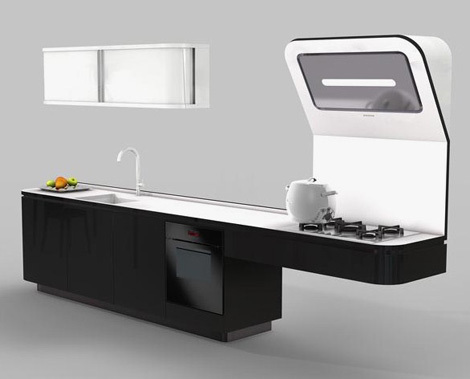 This practical kitchen by Italian kitchen company Veneta Cucine has it all – fashion and function, all the while being efficient in terms of the Earth and economy. The Liquida kitchen created by Elisa Gargan and Stefano Giovannoni puts into practice some important principles, according to the designers. “The objectives that we were aiming for make it necessary for us to seek out high-performance technical materials that are wholly recyclable and can also be used to create new functional characteristics, such as doors which slide into cupboards.” This custom-style kitchen features modern, lacquered facades with minimalist details and an integrated light that illuminates your work space and looks out of this world! Visit Veneta Cucine for more info. How To Create Your Own Amazing Cosmic Star Ceiling. The Ultimate Tuscan Home Decorating Guide. Shade canopies - Dedicated to shade canopies, awnings, tents. Lists companies and reviews products.